DON JULIO 70 YEAR ANNIVERSARY ANEJO 100% BLUE AGAVE TEQUILA WITH BOX, 40% cl/vol .nom 1449 crt 750ml full and sealed.THIS A VERY RARE AND HARD TO GET BOTTLE.NO MORE EBAY.THE BOX IS BLACK WITH SILVER WRITEING STORED IN WHITE OAK BARRELS FOR 18 MOS.THIS IS AS GOOD AS IT GETS.THIS IS A RARE ANEJO TEQUILA. 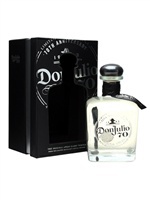 Don Julio 70th Anniversary Tequila 75cl / 40% To celebrate the 70th Anniversary of Don Julio Tequila, they have produced this fantastic A�ejo tequila. Their finest agave plants are hand selected for distillation. This tequila is then aged for 18 months in American White Oak barrels, and then filtered to a pure silver colour. The result is an A�ejo Tequila with the smoothness of a blanco.